Trigger warning: the articles mentioned in this post contain diet language and weight talk. "Is the anti-diet movement leading us astray?" I have to admit - I scroll through social media a lot during the day, as I think most of us do. I think it's fun to follow friends and blogs, and I love the HAES community I've found. It's life-affirming for me to discuss my values with people that share them, and it refreshes me when motivation is low. But when I saw the above headline being shared in my circles, my mind started spinning and my stomach dropped. Intuitive eating and HAES have gained a lot of buzz lately, but also (as with anything rising in popularity) a lot of criticism. Usually, I'm up for an open discussion! It's not my job to show up perfectly for anyone else, nor is it yours. But I highly value IE and HAES, and I like to share that with others. First of all, all of the articles I've read have a fundamental misunderstanding of what it means to be anti-diet. Anti-diet doesn't mean "disregard all health recommendations and exist entirely on highly palatable foods." It doesn't mean you don't care about your health. Anti-diet is pro health. Here's some things we know: dieting predicts weight gain. Size acceptance and intuitive eating improve outcomes. Weight stigma has negative psychological and physiological effects. So instead of a stigmatizing, rigid, and harmful approach to "health" that applauds those with the genetics that allow them to achieve a culturally approved aesthetic, we're offering an approach that fits and honors the health of all individuals. To slap a literal "one size fits all" recommendation on patients is a disservice to not only our patients, but ourselves - it's lazy medicine. When we recommend that patients leave dieting behind, we're recommending that they release the pursuit of weight loss - an endeavor we know to be unsuccessful and mentally, physically, and emotionally taxing. Focus is taken away from external cues like an eating plan or calorie count, and turned inwards to what you like, and what feels good in your body. Instead of eating trendy "superfoods" because we think we have to, intuitive eating opens us up to discovering a wide variety of foods that are pleasurable and satisfying to us. It's not a diet. It's freedom. (For more on how health behaviors align with a non-diet approach, read this and this). Weight is an outcome, not a behavior - meaning it's not something that we can control. Instead of a focus on weight, the anti-diet approach places focus on the whole patient, health behaviors, and the patient's wants and wishes. Every time I hear someone describe this approach as extreme, I remember what it was like the last time I dieted. The crazy tactics I tried to use to avoid certain foods, force-feed myself the "trendy" health foods of the day, and how stressed I was if I ate more than my daily allotted calories. I'm not going to list actual eating disorder behaviors here, but let me assure you - they're more extreme than diet culture. 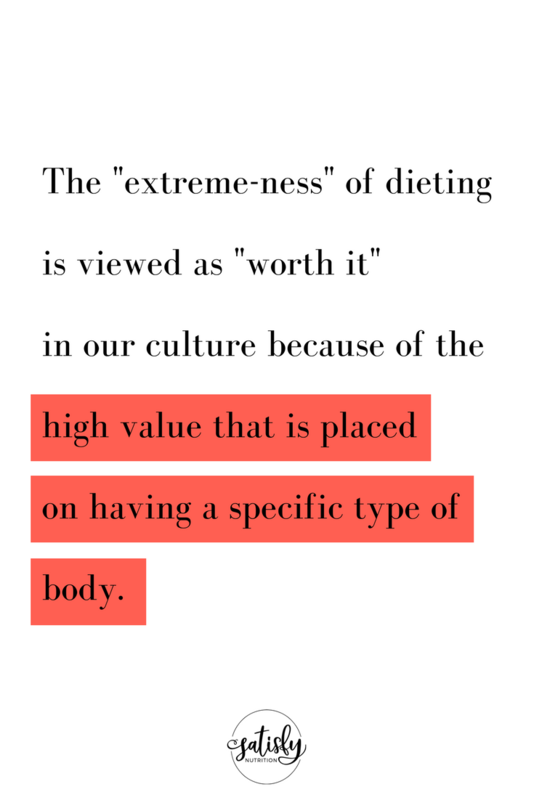 The "extreme-ness" of dieting is viewed as "worth it" in our culture because of the high value that is placed on having a specific type of body. What diet culture is really saying is, "It's only extreme if it doesn't fit into my personal values", aka: "I find it extremely shocking that you dare disagree with me." This viewpoint that anti-diet values are "extreme" seems to stem from social media. The argument is made that anti-diet posters show just too dang many highly palatable foods like pizza and ice cream. As my sweet friend Haley puts it, responsible social media means that if we're going to show food, we have to show all of it. It's natural and normal to eat those foods, among many others. It's fun to share pictures on social media. And nobody is obligated to sit there and type a pages-long caption about how much they ate of the pictured food or what decisions went into choosing that food. Diet culture has done such a loud and effective job of stigmatizing food, that we have to be just as loud and frequent in our posting of those "forbidden foods". If there's one thing I want my followers to know, it's that I don't make my eating decisions based on what will look good on the 'gram, or give much thought to if I have too many desserts back-to-back on my feed. Like unrestrained eating, those little square pictures will balance themselves over time. HOW IS THIS SERVING PEOPLE IN BIGGER BODIES? Pretty well, thanks. A size-neutral and intuitive eating approach actually helps stabilize weight and improves health outcomes, as opposed to a weight-centric approach. Favoriting a weight neutral approach removes stigma and protects our patients from its effects. How are patients supposed to trust us if we don't value their whole health? Who are we to decide who does and does not deserve a holistic, patient-centered approach? When people ask "how does this serve people in bigger bodies? ", they are assuming that people in bigger bodies are automatically unhealthy, that they want to change their body size, and that they have control over their body size. They're saying that the only health that matters is physical health, and that weight loss is the only way to get there (no and also no). The big takeaway: anti-diet is primarily about ceasing to focus on weight as an indicator of health - it's more of how we can use our internal cues and knowledge to guide healthful eating, sleeping, moving, and social patterns in a way that helps us live out our values. Healthcare is a service field. That means we serve each and every person that needs our help and knowledge, and that we don't discriminate based on anything. You deserve quality healthcare. You deserve to be heard. You deserve to be viewed as a whole person, not one value. So no, the anti-diet movement hasn't gone too far. It's not even halfway done yet.